For the first time since 1999, both Michigan State and the University of Michigan’s football teams are undefeated. They head into their rivalry game this Saturday at the Big House in Ann Arbor. The Spartans and Wolverines are ranked 17th and 18th respectively, and the game is so big one fan is willing to postpone heart surgery so he doesn’t miss it. 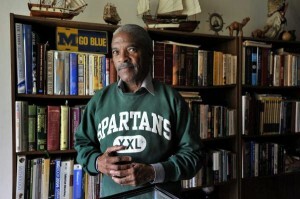 Major Hester is a 69-year old die-hard Spartans fan. He was scheduled to have pacemaker surgery this week but pushed the surgery back a week, so he could watch the game. The Spartans are the very reason Hester needs a pacemaker. Hester gets so worked up during the game, he has to watch the TV with the volume off. Posted in NCAA and tagged Michigan State, NCAA football, U of M. Bookmark the permalink.